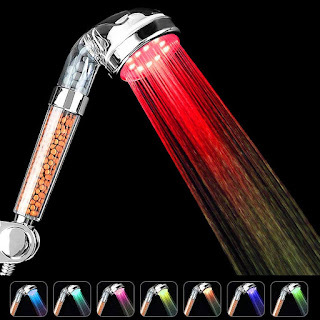 - Enjoy the shower's anion natural health spa shower with wonderful colors! Install the filter shower head in a few minutes and adjust the home standard hose without any problems. - Far infrared mineralized ball filtration system removes heavy metals, chlorine, bacteria and impurities, improves your water quality and gives you a comfortable spa bath. - Making water molecules into small molecules and releasing negative ions helps to improve dry skin, reduce oil secretion, increase cell viability, make skin smoother and reduce hair loss. - Hydroelectric power, no battery or wiring. - 7 LED colors automatically change to 7 bright colors. - Easy connection to any standard hose. - Save water up to 30%. - Double filter effectively removes harmful substances in the water. - ABS chrome material, excellent corrosion resistance, and durability. Port: 20mm, standard G1 / 2 connection (compatible with all size standard shower hoses).